Believe it or not, at 6 weeks old Otis has already been on 2 play dates. 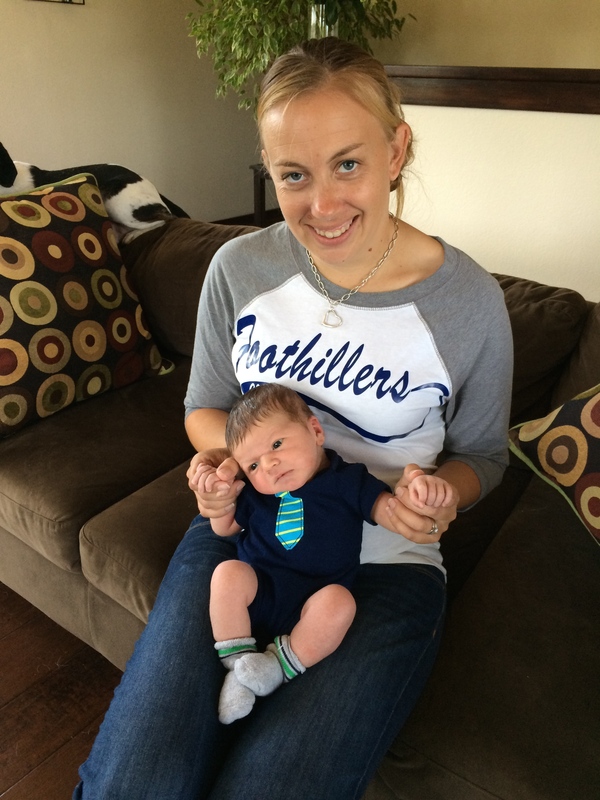 Let’s be honest- he’s not doing any playing yet, but it has been a great way for me to meet other moms and their kids. It is also nice to have something on my calendar for the day other than take care of Otis and shower. 😃 Yesterday the play date was at the park and Otis slept through the whole thing. Here he is up close. Can you find him in the group picture above? I can only think of one thing that is funnier than the sound of a baby farting . . . . and that’s the smile they make right after they fart! Full confession- I am stealing this idea from my friend, Whitney. When her first daughter was born 4 years ago I used to eagerly await her “Dear D- ___ Month” posts. She wrote one each month and it seemed like such a great way to preserve the memories of this precious first year of life. My plan is to copycat Whitney and write to Otis for each month of his first year. Here we go . 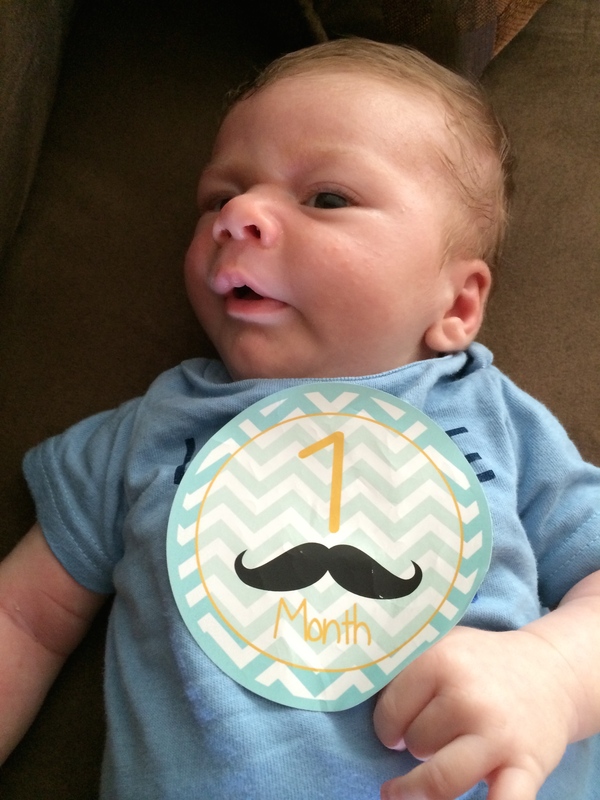 . .
Today you are 1 month old! It is hard to believe that you have only been around for 1 month. 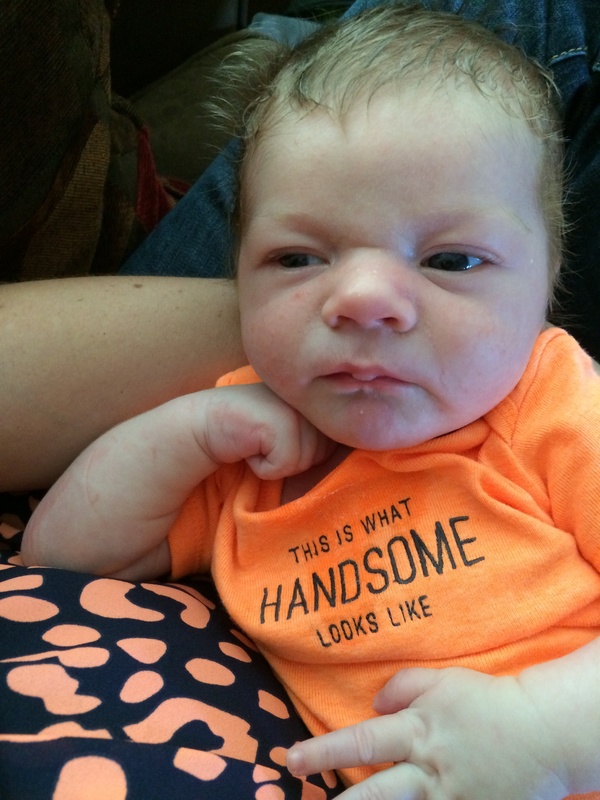 You are such a part of our lives that it seems strange to think back to when you weren’t a real live human baby. That first moment when you came into this world and the midwife told me to take your arms and pull you up onto my chest was one of the most magical of my life. 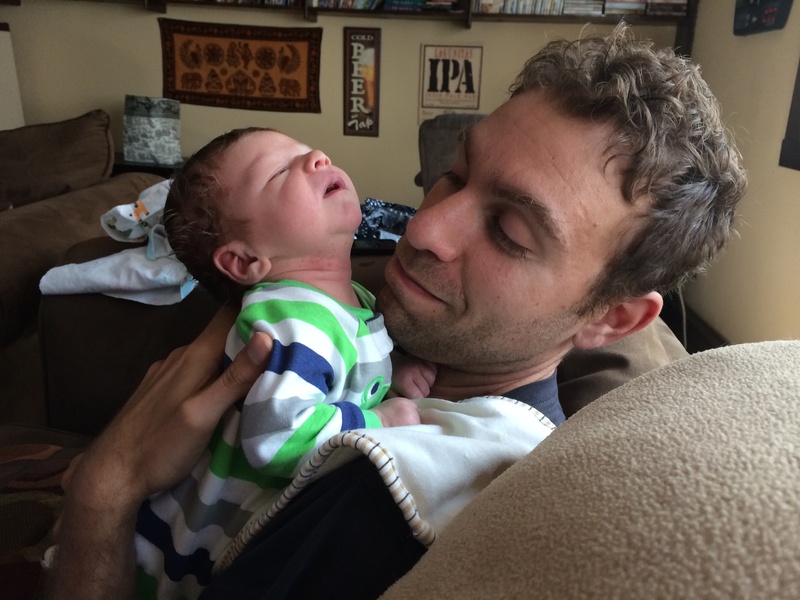 I was so tired from labor and all of a sudden, with you on my chest, I was full of life and full of love and fully invigorated (I won’t lie- the lack of sleep that you have brought to our lives since then have brought some less than invigorated moments). 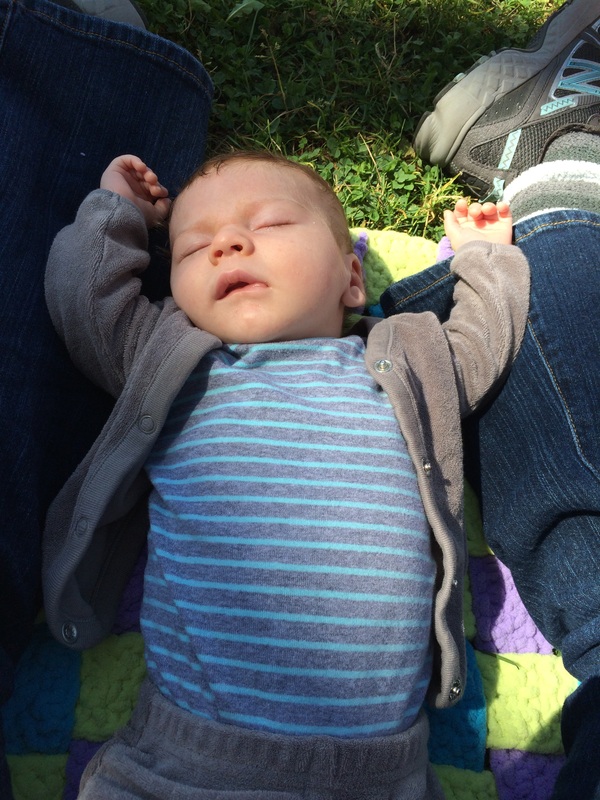 In the beginning you were really good at 4 things- eating, sleeping, pooping, and crying. We were pretty proud of you for excelling at those 4 things. Since then your list of accomplishments has multiplied. You are now a pro at opening your eyes. They are no longer little slits, but are big, round, blue eyes. They react to sounds and sights and follow interesting things. They truly seem to be connected to your brain and are helping you learn about this world you have found yourself in. You vocal repertoire has grown too. In addition to crying you now grunt and squeak. You are actually quite noisy, especially when trying for a good poop. Your mouth makes the cutest little shapes. You have a pretty hilarious frown, an adorable “O” shape, and even a smile. At first the smile only happened when you were asleep, but now you have snuck in a few during awake hours. We can’t wait for even more of those toothless grins! Your neck is crazy strong. You can pretty much hold that big head up all on your own. When I have you over my shoulder you move your head to your position of choosing. When you are on your stomach you can turn your head from side to side. Granted, that neck still gets tired and droops from time to time, but we find it’s strength to be pretty impressive. Your arms have a mind of their own. I don’t think they are really connected to your brain yet. Sometimes your mouth is reaching for me to nurse while your arms are pushing me away. Sometimes you accidentally hit yourself in the face. Sometimes your arms keep you awake if you aren’t swaddled. 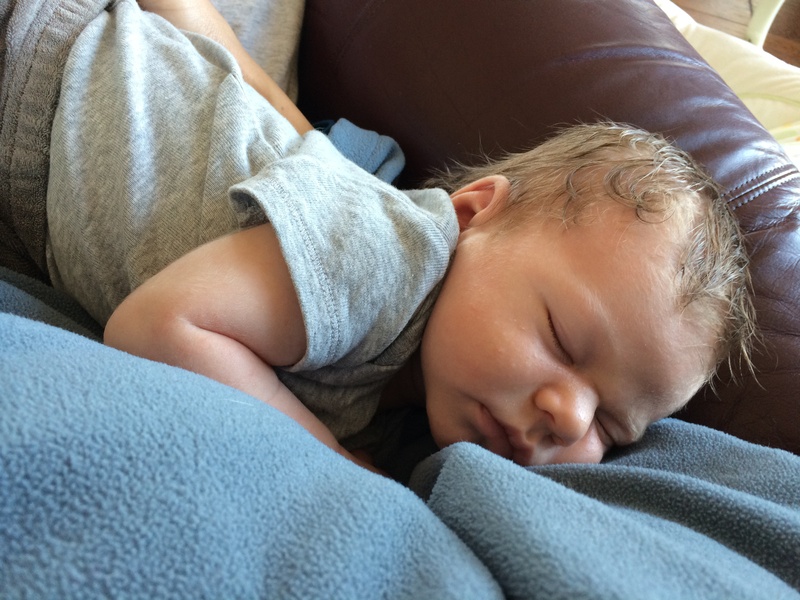 Even though they aren’t conscious movements yet, those arms are exploring and moving a ton. When I hold you, you hold me back. You can grasp our fingers and even small objects. You pull on the strings of daddy’s hoodie and you often stick your hands down mom’s shirt. I can’t wait for you to figure out that you are in control of those little suckers. Imagine the fun that will be! You have gained over 2 pounds since you were born. 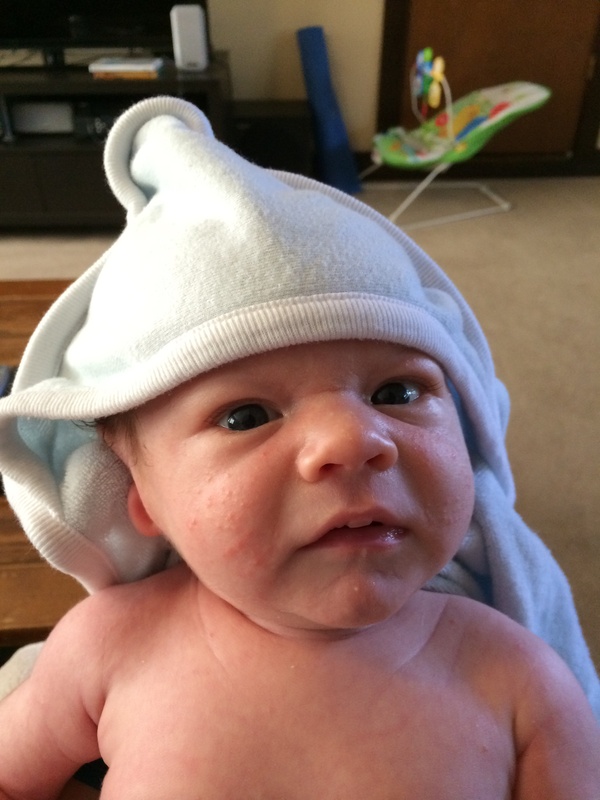 You no longer fit in your newborn clothes or newborn diapers. You are quite the strapping young man. Your legs are super long and getting stronger every day. You love for us to constantly jiggle and rock you. I have a feeling you are gonna be pretty excited to start crawling later this year. You are definitely a lover of movement! You are becoming more comfortable in this world. While your preference is to be held as much as possible, you have started to find happy moments on your own. Laying on your changing table, crib, or play mat you will gaze around you and take in the sights. 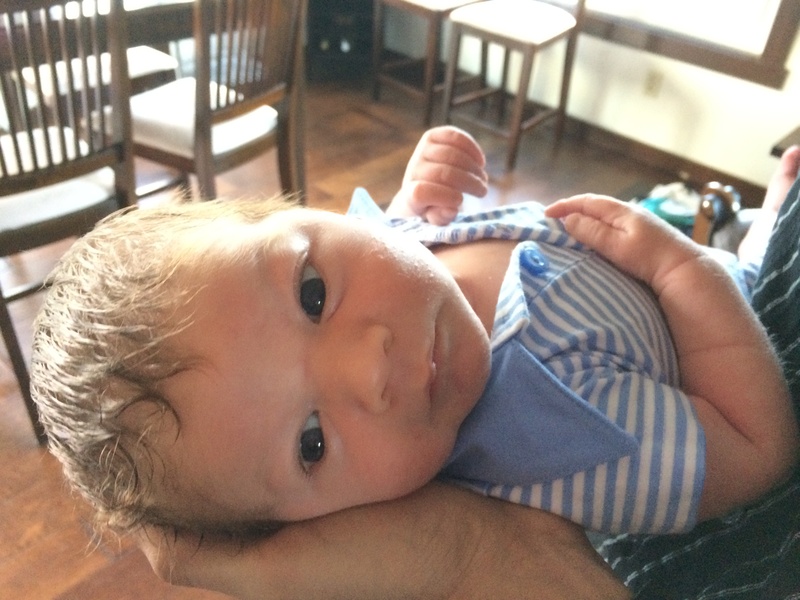 You are only good for about 10 minutes before you cry to be picked up, but that is 10 minutes more than a week ago and usually dad’s beatboxing can calm you back down. You still only like to sleep 2 hours at a time, but you have figured out that night time is when we prefer you to sleep and we thank you for that. During the night you wake up every 2 hours, but then happily fall back asleep after a snack. All in all, you are getting smarter and more adept at living every day and we love watching you figure things out. I can’t wait to see what the second month has in store. It’s the little things that count . . . .
– I started to exercise. Thanks to Brad, Jen Hill, and my dad I got to do a bit of yoga, a bit of ballet, and go on my first jog in over 7 months. So grateful to the baby holders. I feel so much more sane with a little exercise! – I binge watched my new favorite show, “The Fosters.” Thanks Whit for recommending this Netflix find. – Otis and I began our daily tradition of DANCE PARTY. This week’s Pandora station of choice was the Beach Boys. For some reason Otis seems to love my goofy dance moves and off key singing and the two of us spend up to an hour each day boogieing. A week after Otis was born, Grammie and Grampie (Brad’s parents- Bonnie and Garry) flew in from the east coast to stay with us for a week and get to know their new grandson. The picture above was taken right after they arrived and that glowing smile on Bonnie’s face was pretty much a permanent fixture for the next 7 days. They had thought of everything. They had gotten their Tdap shots so as not to expose Otis to whooping cough and they had packed their suitcase by choosing shirts that wouldn’t aggravate Otis’ skin (no baubles or scratchy fabrics). Bonnie and Garry continued to spoil us. Bonnie cooked us her famous chix and chokes (chicken and artichokes) and some delicious spaghetti with chicken sausage. Garry vacuumed and swiffered the hardwood floors. Apparently he and my dad share their affinity for floors free of dog hair 🙂 Best of all, they joined in when Brad went out to work in the yard. 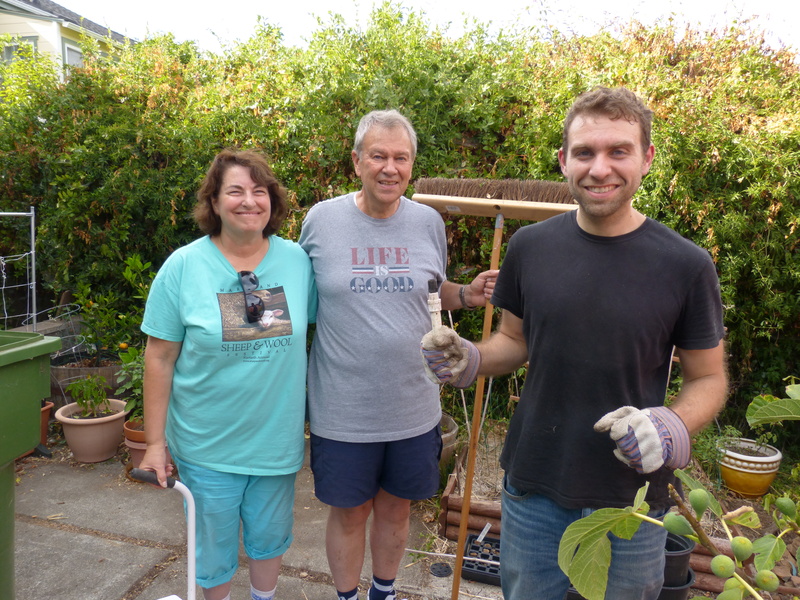 I looked out the window and all three of them were pulling weeds, trimming vines, and doing all sorts of crazy manual labor to make our yard look much better. They filled the yard waste bin and then some. They also became champion baby holders and soothers giving Brad and my arms a much needed rest. 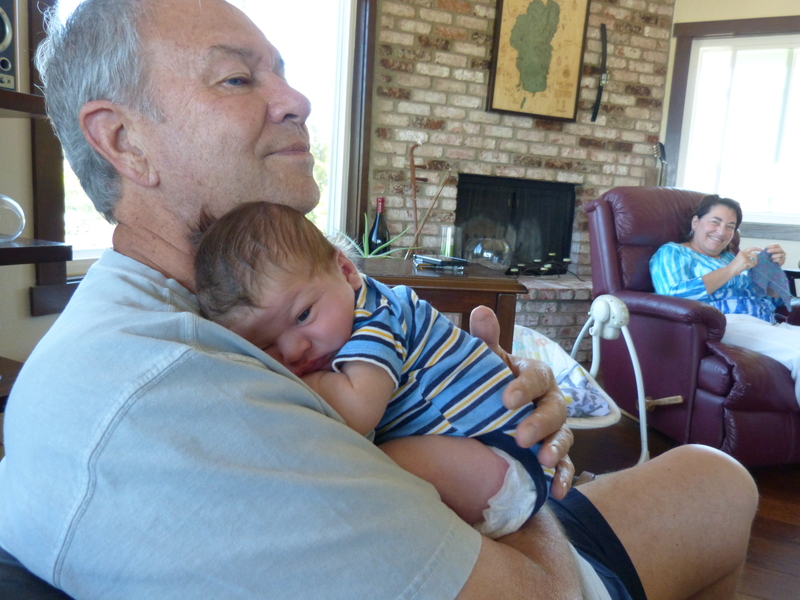 Here are some of my favorite shots of them with their grandson. See, I wasn’t lying about that smile staying on Bonnie’s face. Look at her knitting across the room while beaming at Grampie and Otis. Brad’s brother, Greg, and his girlfriend, Megan, joined us for the weekend. My Aunt Jan also dropped by for a visit. As some of you may know, we lovingly refer to Greg as “toadface.” This dates back to a hilarious face that he used to make as a child. Well, while Aunt Jan was visiting Brad said to Otis “this is your Uncle Toadface.” Aunt Jan heard him wrong and said “Uncle Toothpaste?” And thus a wonderful new name was born. 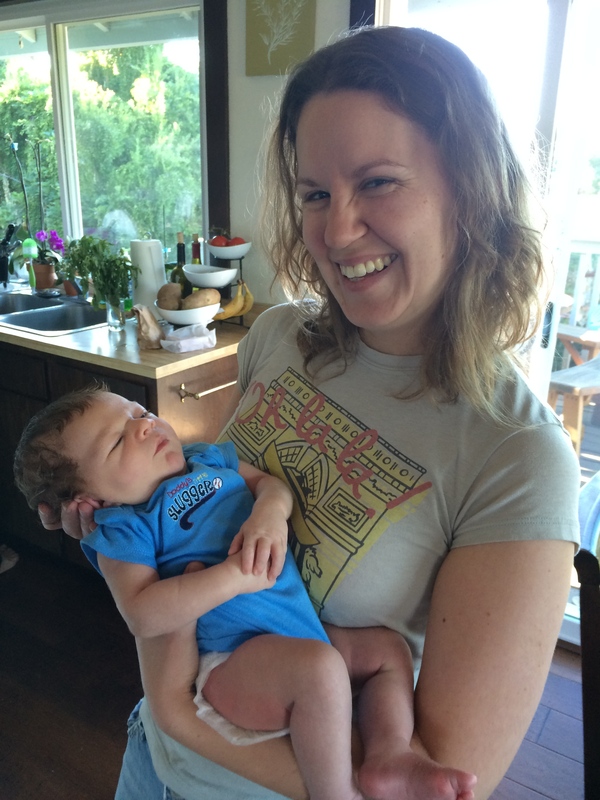 Here is Otis with his Uncle Toothpaste and the lovely Megan. Brad’s Uncle Gerry even dropped by for a bit. Greg and Megan were super helpful. Megan, of course, brought delicious baked goods like she always does. By this point Brad and I were craving a bit of time for Otis, he, and I to be together as a trio. We felt like we needed to start acclimating to what it would be like when all the family left. So the four of them happily obliged us and went out to meals on their own, leaving us home. Greg would always text us midway through the meal and find out what they could bring back for us. Delicious mexican food, lattes, you name it and Greg delivered it. 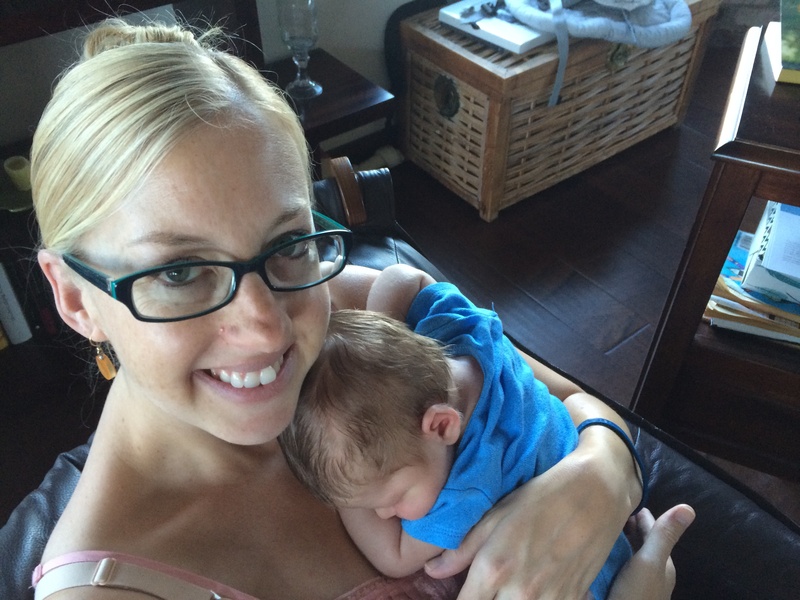 By the time both families cleared out 2 weeks after Otis was born, we were set in every way. The fridge was stocked, the house cleaned, the yard trimmed, and Otis had been showered with more love than you could think possible. 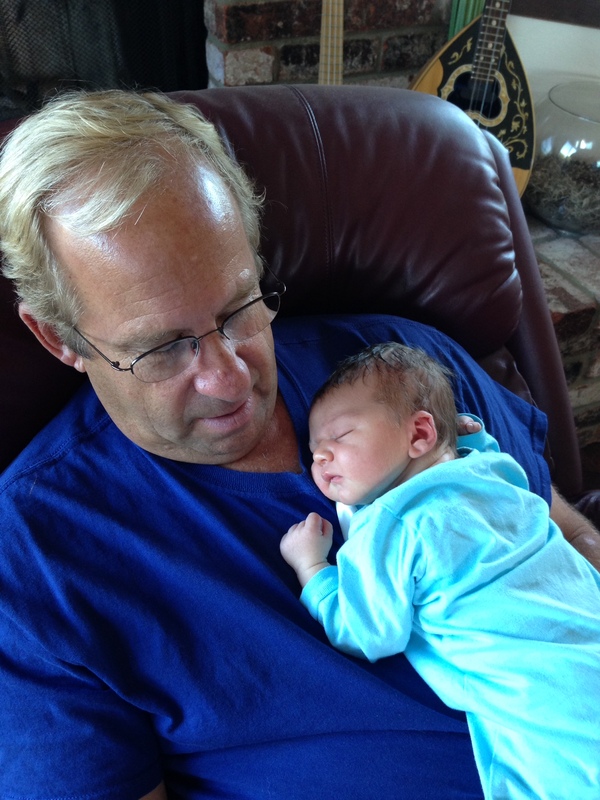 We continue to send both sets of grandparents daily pictures and there will be lots of skype and facetime in our future. We feel very lucky to have such great families! Brad and I were so lucky to have family in our house for the first two weeks of Otis’ life. We had so many helpers that we could forget about cooking, cleaning, etc. and just focus on getting to know Otis and all of his needs. My parents live only an hour and a half away so they were able to come to the hospital while I was in labor. They were in the Santa Rosa Kaiser waiting room from 9am-10pm waiting to greet our little dude. After Otis was born they got to come in and snap a few photos before heading home for the night. The next day they visited us in our postpartum room bringing bagels and coffee for breakfast and chipotle for lunch (the hospital food was not overly delicious). That’s when they both got to hold Otis for the first time. Then they respectfully headed back to our house to care for Lani, the beagle, and Stefan, the duck, while Brad, Otis, and I spent another night in the hospital bonding as a trio. 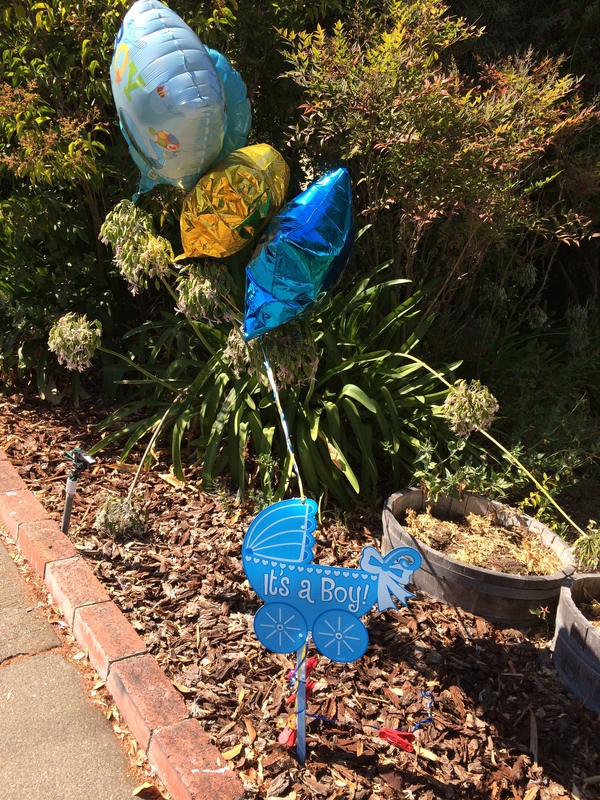 When we came home the next day we were greeted with these balloons and vases of flowers. While I nursed Otis for the first time in his very own room, my mom baked chocolate chip cookies. For those of you that know me, chocolate chip cookies are the way to my heart and smelling them in the oven was like heaven. She also prepared a delicious chicken and asparagus dinner for us. Meanwhile, my dad was busy trying to fix our dishwasher, sweeping our yard, and putting our garbage out. Not to mention, I’m pretty sure he swiffered our hardwood floor twice a day. My sister, Jen, flew up for the weekend to join the Erhart fun. 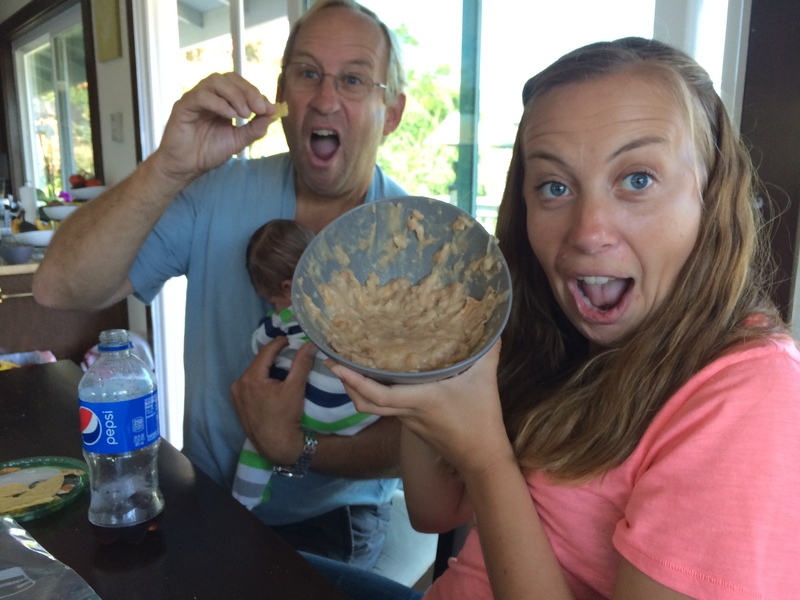 Somehow we convinced her to make refried beans from scratch (pictured below) for taco night. Amazing!!! In addition to waiting on us hand and foot, all three Erharts proved to be invaluable as baby holders. Brad, Otis, and I would struggle through the night only to be relieved to hear footsteps upstairs around 6:30am- the morning shift had arrived, my Dad and sister. This meant Brad and I could sneak off for a nap or a shower while Otis happily cuddled with Grandpa and Aunt Jen. When Brad and I wanted to eat a meal, we could transfer Otis over to my mom’s arms so that we had both hands free to eat with (a luxury we currently miss a lot). 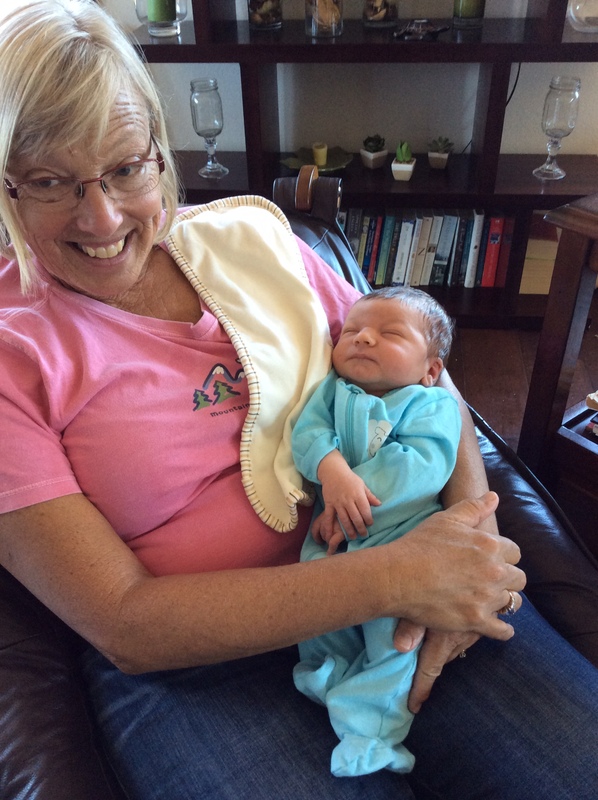 Otis was very content in Grandma’s arms. 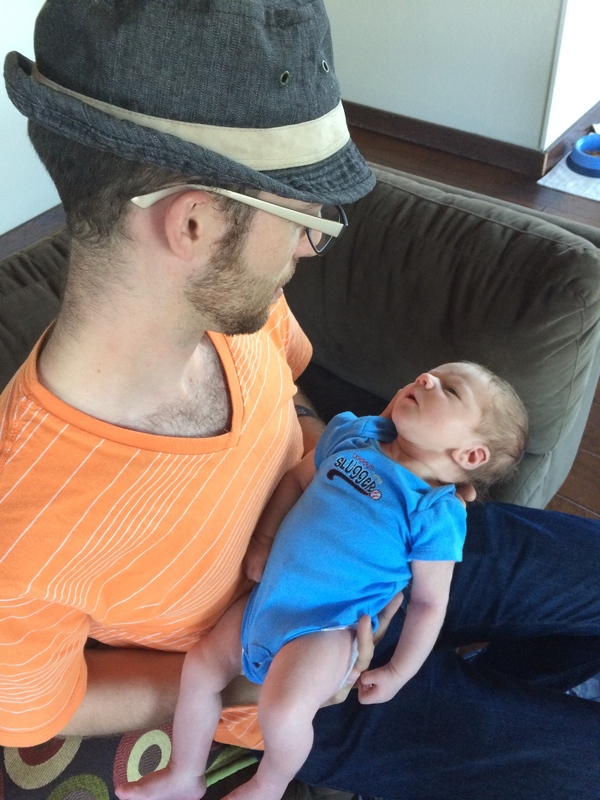 All in all, it was immensely helpful to have my family around us in that first week of Otis’ life. When they set off towards their homes Brad and I enjoyed a day and a half on our own with Otis. It was a perfect amount of time to practice what real life would be like before Brad’s family flew in to help us for another week. More on the amazing Moore family in the next post (whenever Otis deems me worthy of having two hands free to type). He makes sleeping look so delicious. If only he chose to do this at night! Otis has a lot of crafty friends. 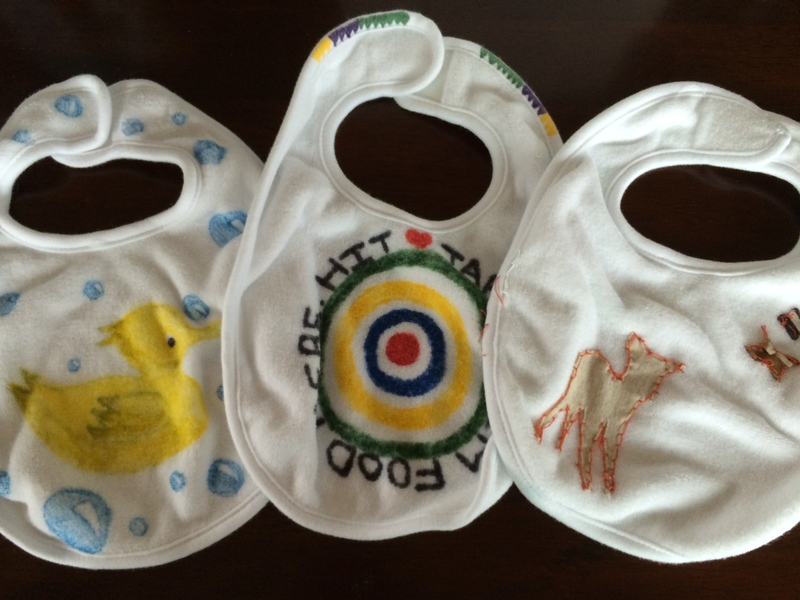 In addition to receiving tons of amazing store-bought gifts to help ease this transition into parenthood, we also received some very special homemade items. My mom and sister threw me a baby shower where the guests all got to decorate onesies. Brad’s mom had all sorts of cool stencils and fabric markers to help those of us with minimal artistic skills. 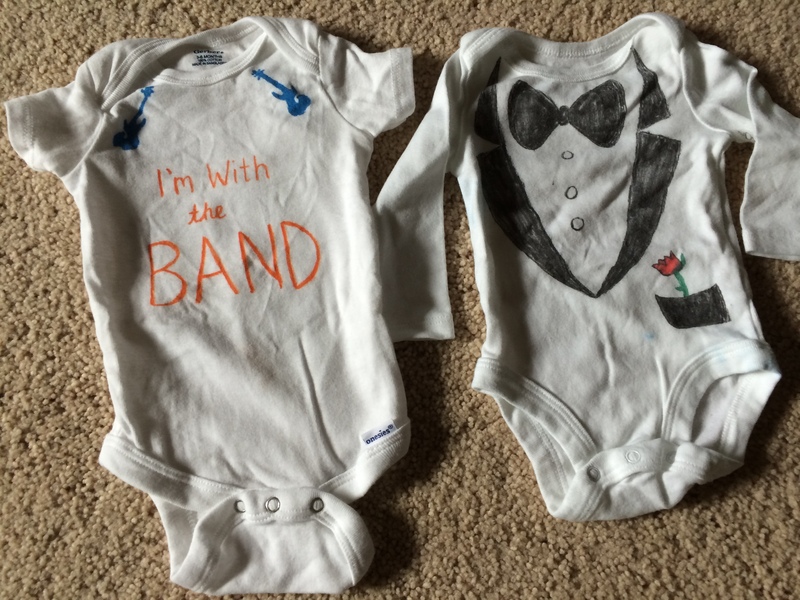 Marin Ballet also threw me a baby shower and they asked my students to make me onesies and bibs. They were absolutely adorable. 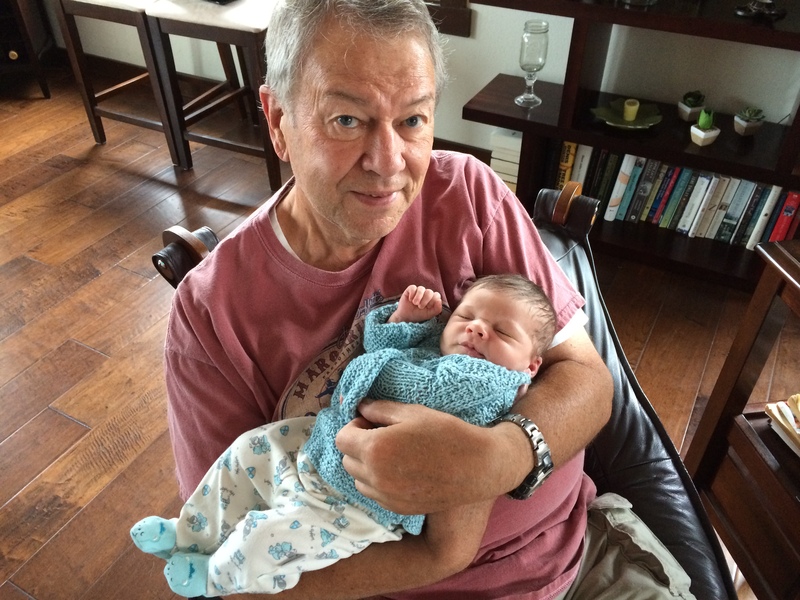 Brad’s grandmother Anne knitted Otis a blanket (pictured) as did my grandmother, Betty, and my mom’s friend’s mother. 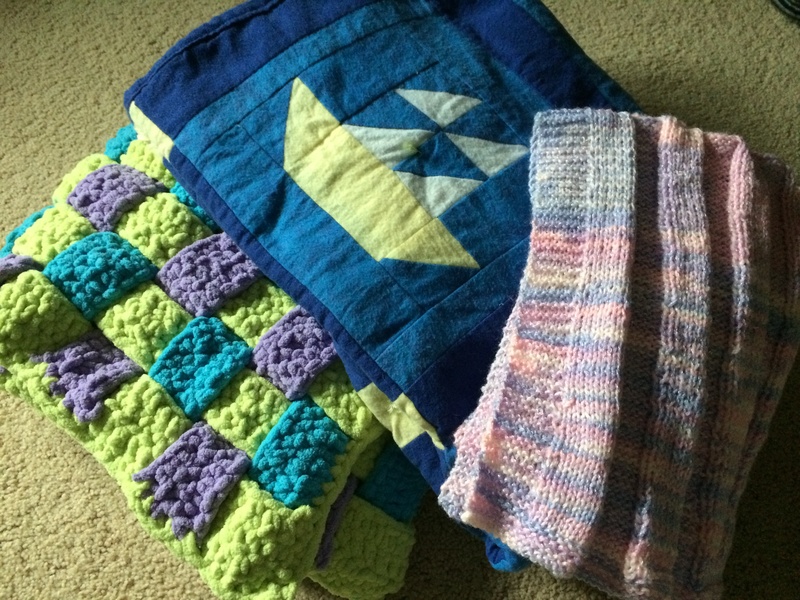 My co-worker, Laurie, made this gorgeous sailboat quilt, and a student of mine crocheted this colorful blanket. 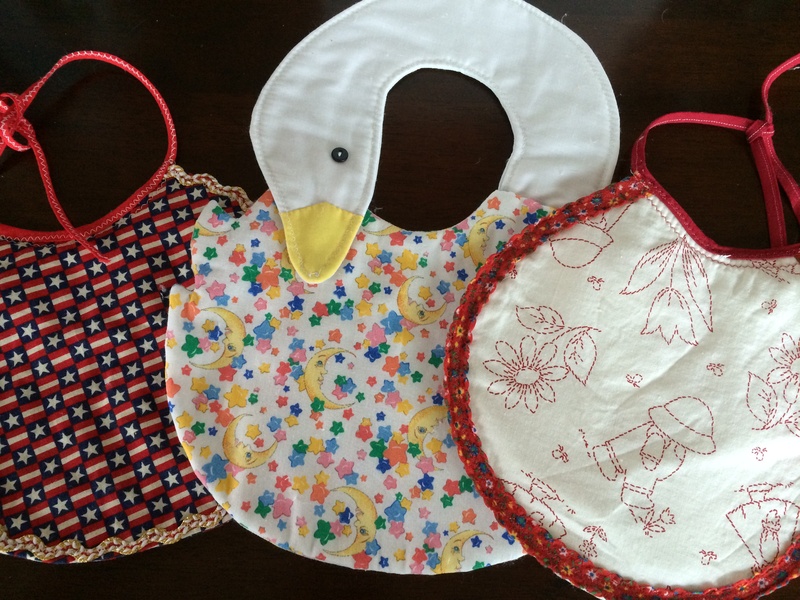 These bibs were made by Brad’s Nana many years ago. Nana is no longer with us, but it is quite special that her handiwork gets to live on. 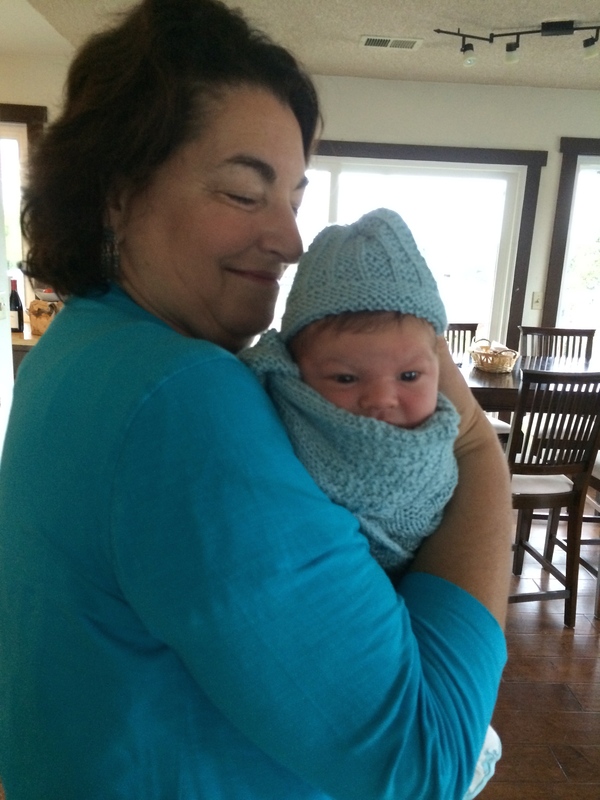 Brad’s mom has knitted Otis a whole wardrobe of sweaters with matching hats and booties. You’ll find one piece of her catalogue above on the left. 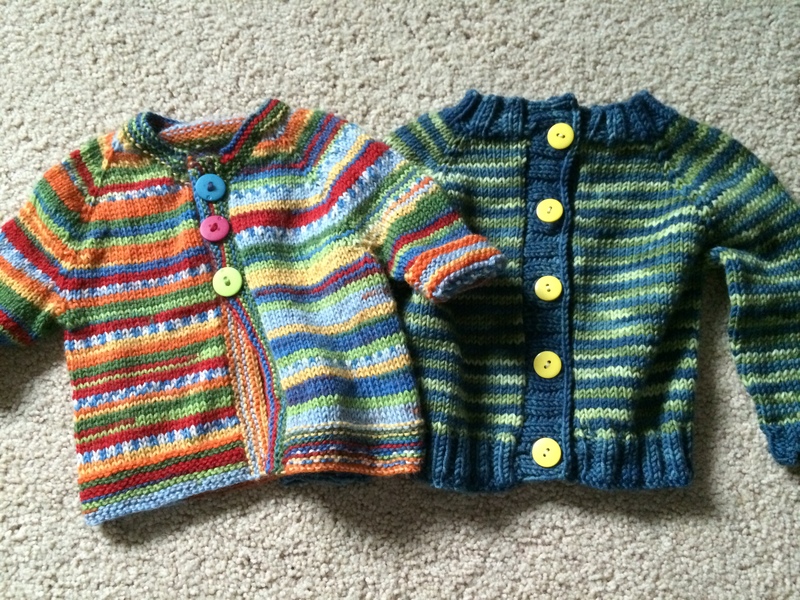 The sweater on the right was knit by my high school best friend, Whitney. Otis is going to be quite stylish! 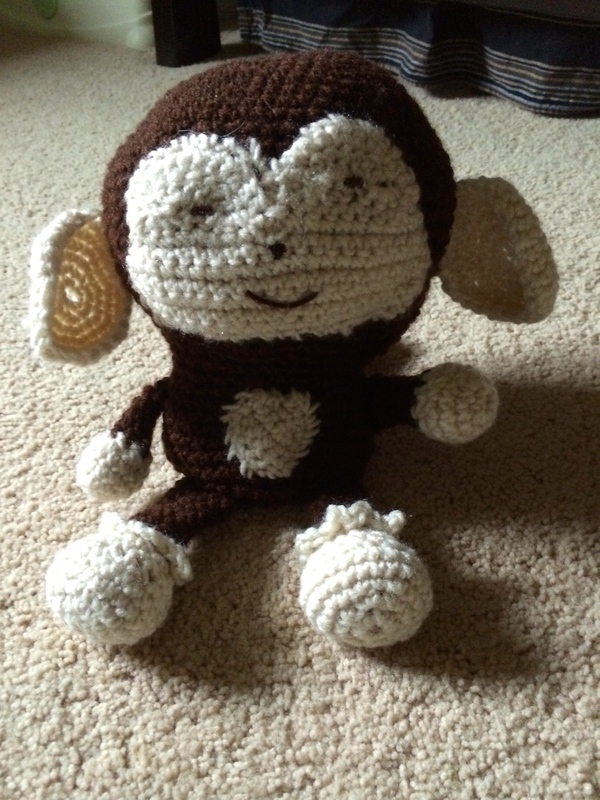 One of my students spent 4 months crocheting this adorable monkey. 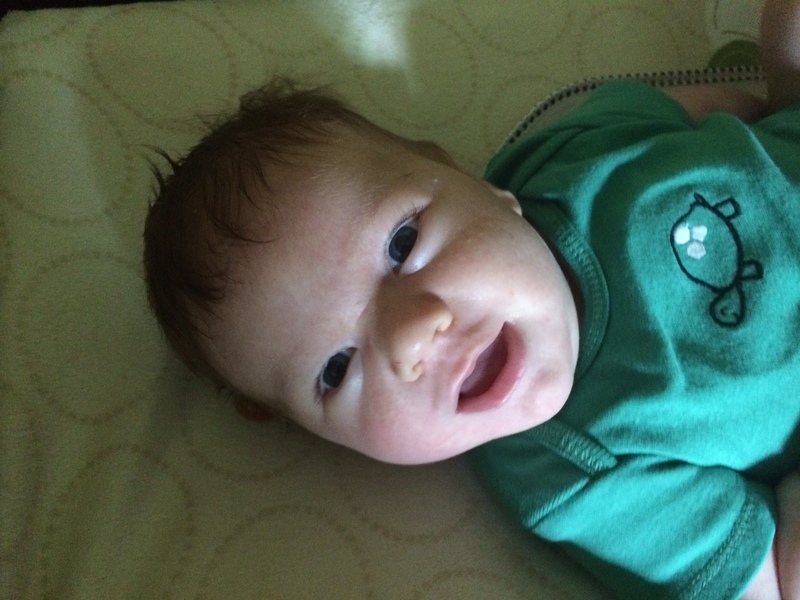 She started it before anyone knew I was pregnant and planned to make it for herself. Once she learned I was pregnant she decided she wanted to make it for my baby. It proudly sits atop Otis’ bookshelf. 2 of my students gave us a box of 72 newborn diapers. 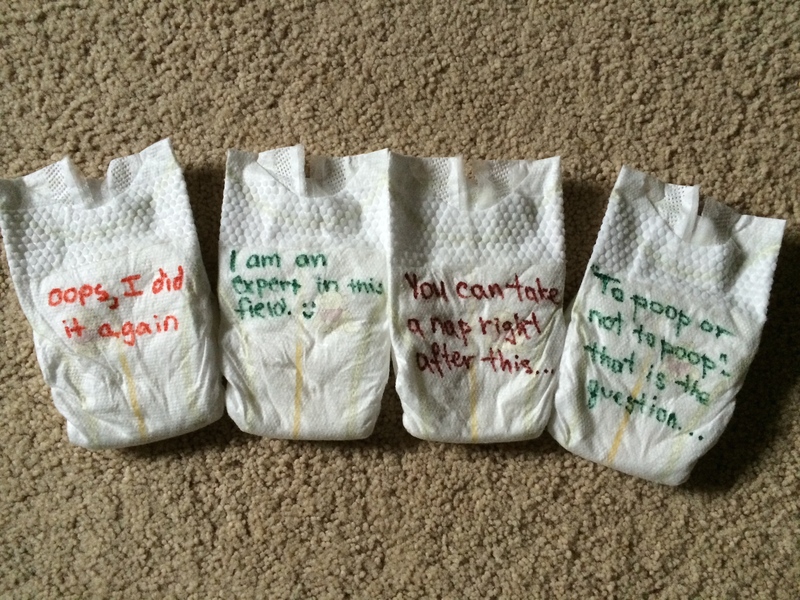 We opened them to find that they had written something on each and every diaper. Some of my favorites were “Daddy’s turn,” “Look I can count . . #1, #2, and “Only 4,000 more to go.” Be sure to click on this photo and read their poetry. Their wit definitely made the first 72 diaper changes way more fun than they should have been. I’m sure I am forgetting some other homemade items (the brain is a bit foggy due to lack of sleep). Thanks to all of you who have spent precious time concocting something for Otis!